How Do We Value Virtual Land? Axie Infinity’s Bloodmoon Rising update gives players the opportunity to own land for their collectible pets by purchasing chests of various biome types (Savannah, Forest, Arctic, and Mystic). Once opened these chests provide the user with a randomly placed parcel of land in the world of Lunacia. The different chests vary greatly in cost and also function so refer to this land FAQ for a full run down. Each chest type gives you one parcel of land, ten items, and a chance at a piece of genesis land as well. The most valuable land in AI by far is in Luna’s Landing and it can only be acquired by completing an entire set of items prior to May 22nd. The second most valuable land is Genesis which has a total supply of 220 and it is randomly obtained by buying chests with the highest chance for one being from any Mystic chest(1.4%) . The land then decreases in value from Mystic to Arctic, Forest and finally to Savannah. 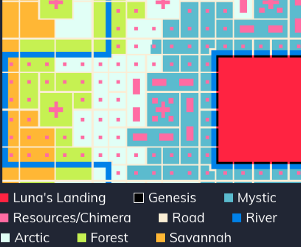 Each type of land from Luna’s Landing down to Savannah is generally located further and further away from the center. During a land rush, when a game first allows people to purchase land, it is difficult to find anywhere to trade the land around — if it’s possible at all. This lack of liquidity means that when tokens do become available for sale they usually are sold at an initially inflated price. This is due to the demand outweighing the available supply of trade offers. Land will not be available to trade for four months — driving up demand during the time between the end of the sale and when the tokens become available for trade. After all of land is released and fully functional the supply of land should be less constrained. There are only 68,868 parcels of land available on the initial AI world map. This scarcity helps to maintain the value of parcels in the entire game ensuring a more stable economy than if the supply were infinite. If the developers choose to expand the game in the future that would most likely result in a devaluation of existing land parcels. Limited supply also favors early adopters who are usually able to secure lower prices as long as the adoption of the game is enough to sustain the supply of land without allowing prices to fall below their initial sale price. Land generally gets more valuable as you move towards the center of the map. Land near the center is usually closer to resource nodes, and has features that land in lower types such as Forest and Savannah may not have access to. It is also closer to Luna’s Landing where special events can occur. Land near the center is also traveled on more frequently by other players providing more opportunity to attract people to your land as well as collect resources players drop as they pass by. Touching or being located close to a pink resource node raises the value of any piece of land. Having a parcel located near a large cluster of nodes will also raise it’s potential value. Resource nodes get more valuable as you approach the center because the Chimera monsters that spawn in those areas are assumed to be more powerful and will drop better items. Resource nodes are smaller but closer together the further you get towards the center of the map meaning that buying a Mystic or Arctic chest has a higher chance of placing you near a node. It is tough to say what the future value of land will be that is touching the outer edges of the map because it is unclear if the map will wrap around on itself or not, allowing for more foot traffic. What is clear is that land touching the maps edge will be devalued by most players until they know any potential benefits to being on the edge such as harvest-able resources surrounding the map. Some players will want to live in solitude and may value being on the edge of the map, but they are also an edge case. A large portion of the map is surrounded by a thick river that is most likely harvest-able for fish and other resources. Land touching or located near water will be valuable for this reason, however players cannot pass over water making it undesirable for anyone who wants their land to be closed over by many players. For this reason I value land touching water much more than land very close to water where it can’t reap the benefits but is still blocked by the topography. Roads will be the most likely means of travel since they offer a 300% travel speed bonus and are the only way to cross water. Having road adjacent land is valuable for anyone offering services on their land that want more visitors and for this reason it is one of the most valuable factors.The potential downside to owning land near roads is that it is unknown if anyone traveling on the roads will drop resources on the adjacent parcels or if they will only drop them on the road itself, making road adjacent parcels useless for resource harvesting of passer-bys. Some buildings require more than one parcel of land to be built and could potentially need those parcels to be in certain shapes, such as a block of four, before you can build them. Having a larger estate for sale can increase the overall value of the parcels in the bundle because the scarcity of land means that it is easier for the buyer to find connected lands when it is purchased in a package deal. The actual shape of the parcels can also influence the value if they create an interesting feature, surround a point of interest, extend between or even fill an entire space, or just make an interesting pattern. The closer the coordinates of your land are to 0,0 the more valuable it becomes. A location that is under four total digits tends to fetch a higher price as well, such as 11,11 versus 111,111. Interesting numbers such as a palindrome (12,21) can also increase a lands value but that additional value is very subjective. Wormholes will tear open eventually allowing for content creators to link their work to their land using the Lunacia SDK. High quality third party content is potentially the most important factor influencing the value of virtual land. Unfortunately even if a good content creator owns a parcel of land, the value of their creations cannot be accounted for in the value unless the content transfers with the sale of the land, which is unknown at this point. One way that the value of third party content can be captured is by posting up shop next to it! Having neighboring parcels that have high quality content can drive visitors to your land and possibly lead to collaboration as well. Creating neighborhoods with similar interests and themes could help players to not be overwhelmed by the size of the world map and begin to assign inherent value to parcels located in particular neighborhoods. The upper left quadrant of the map is one such neighborhood as it houses mostly early investors. When land is fully functional it will allow players to have a large variety of buildings and items on it ranging from ones that buff anyone located on the plot to item shops selling potions and trinkets produced by the land owner. The more developed a parcel is when put up for sale the more valuable the land becomes. This is especially true if the items or buildings are rare or hard to build. 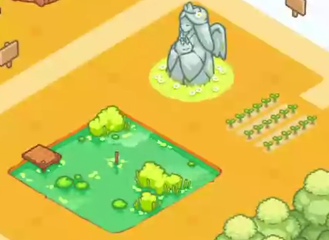 Rarer lands such as Mystic lands will most likely allow for more valuable items and buildings to be placed on them. What you name your land and how you describe it can make a large difference to a potential buyer. We are not sure how much functionality related to this will be provided in Axie Infinity in the future, but it could be an important factor. Highlighting some of the things discussed here in your title can help to make the parcel shine (ex:”roadside potion shop near center"). A good name can go a long way in helping a potential buyer visualize the land and how they can put it to use. I hope this analysis sparks your curiosity in AI and in virtual land, or at least kept you from watching TV. In future articles I will explore some of these factors in more detail and go into some buying strategies as well. You can learn more about Axie Infinity on their main website and also within their very active discord community. I replied via twitter - Thanks for verifying! Nice article, you've made the game look so much fun. At its core Axie Infinity is a game about collecting, fighting, and breeding but the community is also involved in creating multiple third party games based on the Axie's assets as well as supporting this land based gameplay. I suggest you take a look at the discord community https://discordapp.com/invite/BYqD5Gn. Congratulations @felblob! You received a personal award!